Houston — The American Council of Engineering Companies (ACEC) Texas awarded civil engineering firm Lockwood, Andrews & Newnam, Inc. (LAN) a gold medal for its work on the Layne water pipeline and infrastructure project. The award, given under the water and wastewater services category, will be presented during the ACEC Texas Engineering Excellence Awards Gala at the Four Seasons Hotel in Houston on March 26, 2018. The Engineering Excellence Awards Competition has been held by ACEC Texas since 1975 to honor and recognize outstanding achievements within the engineering community. A panel of judges around the state select projects based on innovation, future value to the engineering profession, social and economic considerations, complexity and exceeding the client’s needs. This is the third gold medal award won by LAN in the last four years. Hydraulic fracturing, or fracing – the process of cracking rock deep underground to release oil and gas – has revolutionized the oil and gas industry and helped reduce U.S. reliance on foreign oil. One of the biggest components for fracing is the availability of a precious resource: water. It takes millions of gallons of water – in some cases, enough to fill nine Olympic-size swimming pools – to frac a single well. Based upon industry forecasts, non-potable water usage within the energy sector is expected to more than double over the next few years. To keep up with this voracious demand, Layne Christensen Co., a large water well drilling company, partnered with LAN to build a high-capacity water pipeline and infrastructure system to serve energy producers in the Delaware Basin, one of the most active oil fields in the U.S. 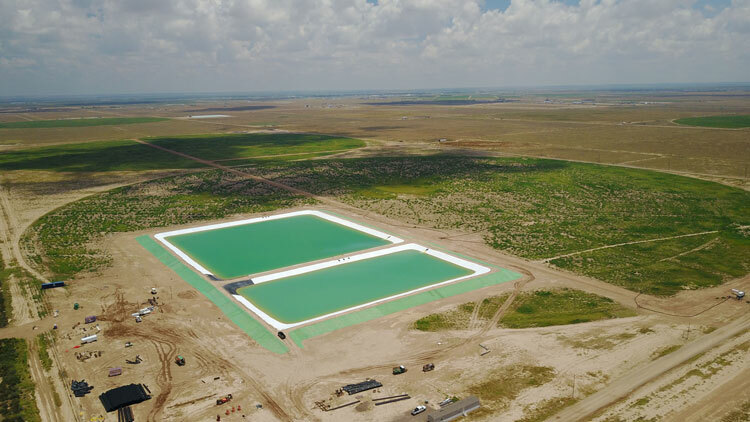 The water infrastructure system, which is anchored by nearly 1,000 acres of company-owned, highly-productive water-producing land near Pecos, Texas, includes non-potable water wells, pump stations, 20 miles of pipeline, and in-ground storage reservoirs. To serve Layne’s customers as soon as possible, LAN completed the design and managed the construction of the water infrastructure system in eight months, including less than 90 days to complete the 20 miles of pipeline. The project will provide a steady reliable supply of non-potable water to oil and gas companies and help reduce their reliance on potable water for fracing operations. Also, delivering water via pipelines will enable these companies to save millions of dollars in water management costs. Furthermore, the project will provide a safer and more sustainable alternative by taking trucks off the road.